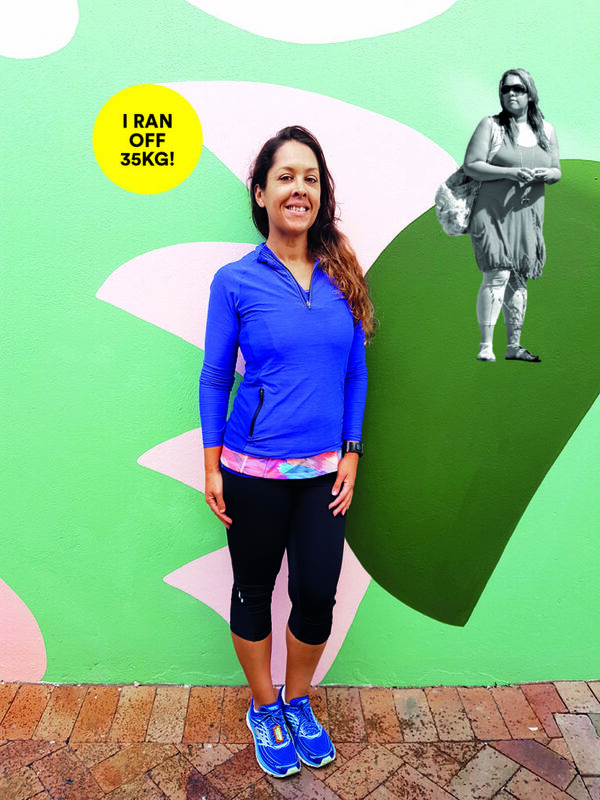 Bianca-Leigh Nagel Ran Off 35kg! A victim of fat-shaming discovers the secret to self-confidence. Being big was all I knew. I spent the first few weeks of my life in hospital, because I weighed 5kg when I was born, and doctors had to dislocate my shoulder to get me out. Over the next 30-odd years, I grew accustomed to my yo-yo’ing weight – and the fat-shaming and cruel taunts that came with it. My best friend died when I was 21, and I became depressed. I used food as an emotional crutch, and long working hours as an excuse not to exercise. Then, in my early 30s, I was retrenched, which only worsened my psychological state. The turning point came in 2014, when at the age of 35, I was rushed to hospital with stomach pains, dizziness, high blood pressure and a racing heart. At first, doctors thought something I’d eaten had caused a blockage; but it turned out to be nothing more serious than the fact that I’d overindulged on the holiday I’d just returned from. A nurse warned that unless I was prepared to make drastic changes to my lifestyle, I was at high risk of a stroke. That was a horrifying thought. Lots of people ask me what my secret is, and they’re almost disappointed when I tell them it’s ‘consistency’. I run four to five times a week, and cross-train twice a week; and although I watch my portion sizes and ensure 80% of my diet is nutrient-dense, I allow myself the occasional slice of pizza or scoop of ice-cream. Being consistent – as opposed to searching for the ideal – means it’s okay to fail every now and then. My biggest challenge was that I suffered from Polycystic Ovary Syndrome [PCOS – a hormonal imbalance and metabolism problem that affects women of child-bearing age], which meant that – frustratingly – I lost weight slowly. I’ve gone from huffing and puffing around a 900m circuit to completing four marathons and an ultra marathon. Probably the biggest transformation I’ve seen is in how confident I feel in my own skin. I’d always told myself I couldn’t do things, be they work, relationships or ambitions. But running has shown me that I can, and that it’s even okay to fail sometimes. I used to be a shy person; running has given me new-found confidence to expand my circle of friends. I’ve met people from a variety of backgrounds, cultures and age groups. Running has also taken me off the couch, and to new places I wouldn’t have had reason to visit otherwise. Inspired by Bianca’s story? Join the club and start your weight-loss journey with the Run It Off Plan below. What are you waiting for?